Discussion in 'PC - Re-Logic' started by Loki, Apr 12, 2018. As you all know from when we first announced the game a long while ago – and as we repeated in our subsequent posts - Re-Logic’s focus has and always will be on delivering complete and quality game experiences to our fanbase. Just to underscore it once more, this means that we will not compromise game quality for speed to market or for any other reasons within our control. Our team has a clear vision for this game – one that we shared with all of you with much shared excitement – and, in spite of all of our efforts, the current state of the game remains equal parts far from that vision and beyond behind schedule from our initial planning when we shared Otherworld with all of you three years ago. Progress has absolutely been made during that time – but unfortunately, a very thorough status review of the game versus its intended design showed both the Re-Logic and 505/Pipeworks teams that things were quite a bit further away from the finish line than we had imagined. Taking the massive amount of work that would be remaining to complete along with the extensive time it would take to get that done, and how that would greatly interfere with the pursuit of other projects on behalf of Re-Logic – it becomes clear that this leaves things in a very undesirable state. As a result, we have made the decision to terminate development of Terraria: Otherworld. We sincerely thank both of our external development teams for their hard work on the game, but at some point, we have to be honest with ourselves and realize that Otherworld simply is never going to reach its potential in any sort of reasonable time or fashion. 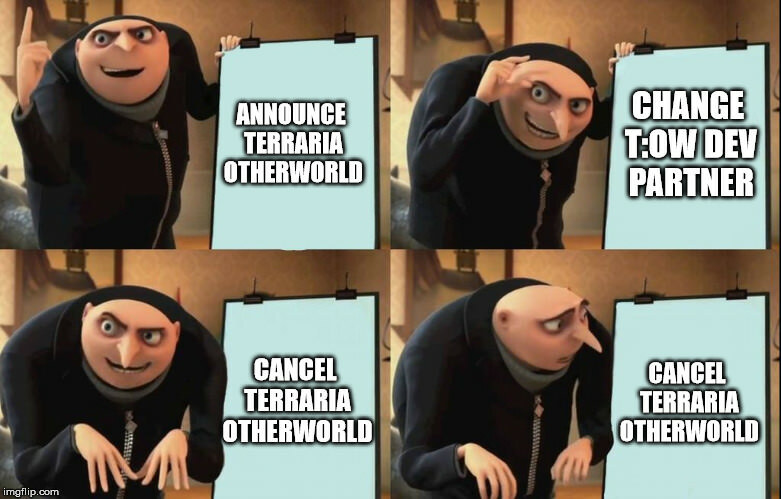 We know that the cancellation of Terraria: Otherworld will not be happy news to anyone. It is FAR from a happy moment for us either, when we look at all the time/effort/resources that we poured into the project. However, we feel strongly that we owe it to our community and loyal customers to uphold the standards that both you and we expect and to focus on delivering the best possible games that we can for you all to play. Come whatever may, quality is simply not something we are willing to compromise on to make a quick buck. It may be painful in the short term, but our sincere hope is that it will pay off for everyone in the long term in regard to our future games. T:OW will never come to pass, but its lessons learned and ideas generated will absolutely yield dividends for everyone. In hindsight, it goes without saying that we never should have spoken publicly about this game as early-on as we did. We will fully own that error in judgement. Moving forward, we will be far more judicious about only sharing information on projects in which we are fully confident in regards to timing, etc. We can only apologize for all of the emotional rollercoaster this caused. Trying to outsource development of such a critical title for our company – even if just in part – was not the way to go. Moving ahead, our focus for the core development of new/future titles will be more inward and will seek to utilize our own people. We will share more information there just as soon as we have it. Re-Logic has possession of the game (design, code, art, sounds, etc.) as it exists today, and there are still a ton of amazing ideas under the hood here – many of which have never been publicly shared. These are ideas that we have not and will not forget and that you will very likely see implemented in our future titles. Active development of Terraria continues - 1.3.6 is still very much in active development. We know that we have not shared a lot in the way of spoilers there – but rest assured that the team has been working tirelessly on our next PC wave. This keeps our partners at 505/Pipeworks wholly focused on Console/Mobile/Switch – and there is still a TON to get done there, so that should be good. We are sure that you have a ton of questions, and we will answer what we can – but we will not delve into some areas out of either respect or confidence or the unknown. So we will ask your patience and forgiveness in advance there. Thanks! ST0RMBR3AK3R, _hitsuji418, MasTroneP and 99 others like this. Sad news indeed, but much respect to Re-Logic for making what must have been a hard decision. Looking forward to seeing all these unknown ideas in any upcoming project that RL produces, as I'm sure they will be great when they come to fruition, whenever that may be. ST0RMBR3AK3R, VenusSlicer, MegaToadmaster and 25 others like this. Pretty bummed to say the least. Game looked to have a lot of potential. Lessons learned though, I'm glad that Re-logic is taking something away from this and moving forward towards a more structured and invested future regarding Terraria. Doanage, MegaToadmaster, Laluzi and 16 others like this. It is a very sad day. Many were looking forward to this game, and I was also fairly excited for it. But development for Otherworld has been very difficult and it impacted a lot of Re-Logic's plans. I understand it was a very difficult call to make, and sometimes it doesn't work out. Regardless, I still know that Re-Logic will continue to make great things in the future to come. Whether the ideas from Otherworld manifest in Terraria 2 or a new project unrelated to Terraria. It will be exciting to see what is to come. You'll pull through and continue to do amazing things. If anyone can do it, I know the awesome people at Re-Logic can, and I will stick with everyone through the ride through the bad times and good. There is still much to look forward to. Doanage, VenusSlicer, MegaToadmaster and 14 others like this. Damn. At least there was an official statement, glad you guys did that for us. It would have been so much easier to just let it fade away, like Half life 3, but you guys made the right decision and let us know. Honestly, thank you for doing that. Doanage, sugneA, Maricon sandy and 19 others like this. Can't help but wish this news came with a "now what?" section for a future project. This really isn't a surprise at this point, but I am glad that the uncertainty of the project has been removed. JJ12terrarian, CommonRed, cooldawg1234 and 58 others like this. CommonRed, SensibleNerfActivist, xd Fruity and 30 others like this. I can't say that I'm not disapointed, but I understand where the desision came from. Instead of perseverating on what could have been, I hope that we can all look to future to what will be. There is still much to be excited for. 1.3.6, the switch port, and the overhaul of console/mobile, as well as everything after that. I can't wait to see what the future holds. Lunaris and GoldenArrow like this. The concept had a lot of promise. That's why I supported it all these years. As for moving forward, I could see the idea of taking the world back from evil being implemented into the standard Terraria as a world generation option, with additional tools and rewards given by the Dryad to support and reward for your efforts. Very saddened by this announcement, but I suppose it's for the better. If T:OW is no longer a thing then what about project called "SuperX"? What's next? Is there a chance some Otherworld concepts will be added to Terraria? Jetstream ∞ and Ranadiel like this. Unfortunate to hear, but an understandable decision. I would much rather have a quality product from Re-Logic than forcing out something you guys aren't happy with. Lunaris, NotaVoltorb and rubeszilla like this. It's indeed sad, but i would love to see some of the ideas of Otherworld implemented on the current Terraria . Laluzi, Divine Rabbit and Mackeye like this. Well, damn. Always hoped the best for this game and knew that it would be worth the wait but hey, what can you do. Glad you guys are still holding strong and have learned from this. Hope the best for your guy's next project, and will keep looking forward to Terraria. JrTighe and Ori like this. -This news are indeed something unexpected, but still you guys had you reassons to make this decission and we respect it, Terraria developers team is great enought to have a great future no matter what. Thanks for this info we will always support you guys <3. fat dirty gamer likes this. The last thing I am worried about is having to wait. Never sacrifice quality for cash. I sincerely love you RL and I type this knowing you'll do great things. wolfman6666, Mackeye and rubeszilla like this. Always a tough call to make! Can't wait to see what lies in store for the future of Terraria! ST0RMBR3AK3R, wolfman6666, Bloodscar246 and 2 others like this. ST0RMBR3AK3R, Laluzi, NotaVoltorb and 1 other person like this. I would be interested in seeing some sort of documentation about the development process of the game, where it was headed originally, where it was supposed to go after the restart and what ultimately lead to it being cancelled, accompanied with screenshots, artwork, developer comments and what not. SensibleNerfActivist, IndigoGollum, taco360 and 10 others like this.